I never really was a big Steve Jobs fan. 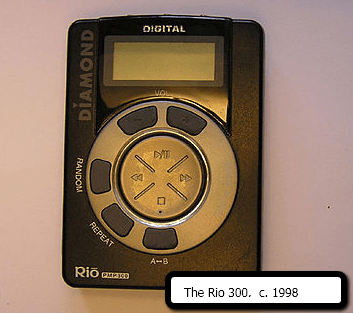 Back in I think 1999 I bought what i think was possibly hardware MP3 player ever manufactured, the Rio 300. It could fit less than an hour’s worth of music at 128 kbps. Here’s the thing most people don’t remember about the Rio — at the time it was marketed to joggers. That was the market. All the ads were about the fact that you could finally jog without your music skipping. That wasn’t why I bought it of course. But the prevailing wisdom of the time was that only people that had no other choice (like joggers in a world where the Sony Walkman was dying) would buy a hardware device that was such a thin shadow of what a CD player would offer you. Who the heck was going to listen to compressed music through earbuds off a device that got music not from your shelf, but from a computer. I kind of resented Jobs when he popularized the MP3 player a couple years later — he was a latecomer — it was like being an indie music guy in 1991 and then suddenly every idiot is listening to Nirvana. I had to listen to how Apple had invented the MP3 player, etc. But what Jobs got was what us MP3 Player lovers already knew — the advances in how this changed how we listened to music made this not a secondary device, but a primary one.The MP3 Player had moved from a niche device for joggers to something that would soon become the primary mode of music consumption for most people. That’s where we are right now with places like Full Sail, UoPhx, Kaplan, others. Those are the Rio 300s of the world right now. And they are marketed to people for whom the main system doesn’t work — the “joggers” of the student population. What the theory of disruptive innovation tells us is that is likely to change very, very shortly. There are some very limited, very solvable problems in online ed. They will be solved soon. Online education is quickly becoming about more than just joggers, and soon it is F2F that will be the niche market. That said, I think those that find the right hybrid of F2F and online will do very well. You don’t stop seeing bands live because you got an MP3 player, etc, etc. We will continue to have residential students, face-to-face class sessions, co-curricular activity. These will hopefully be blended into a rich online experience. But our days of thinking of F2F as the “go-to” option will soon be over. We are going to have to start treating online as a first-class option, and making decisions based on that. Personally, I think it’s exciting. So if you want to honor Steve Jobs today and you are in education, think about how we are going to make that stuff happen, with elegance, style, and humanity.